The setting of the Black Mirror series is the near or approaching future. Some advancement, offshoot, quirk, misapplication, or malfunction of technology provides the premise for each episode. Series—the show uses series instead of season—four follows this same model and offers us six episodes. “USS Callister” starts series four. A computer programmer uses stolen DNA to make copies of his insensitive coworkers. He then places them in a game universe resembling Star Trek in which they are cruelly forced to obey his every whim. A number of people have focused on what the episode may indicate about (toxic) masculinity. While that reading is certainly there, the episode is also about the ways in which intelligent and sensitive people are mistreated and, consequently, retreat into worlds of their own making. There may also be some non-gendered commentary here about absolute power and that ways that it can negatively affect people as well as commentary on the vicious cycle of victims becoming victimizers. Unfortunately, the episode also reinforces and perpetuates negative stereotypes about gamers. It’s an okay enough opener, but not the stunner some people make it out to be. “Arkangel” revolves around an implant a mother, Marie, places in her daughter Sara. The implant allows Marie to track Sara, to see and hear what Sara sees and hears, and to filter out objectionable images and sounds. Ultimately, Marie begins to realize she cannot protect Sara from every bad thing and in the process of trying to do so both alienates Sara and renders her unprepared for the real world. We already knew that (maybe this is for helicopter parents who haven’t figured it out yet). It’s a solid but predicable segment without many surprises. “Crocodile” focuses on a machine that an insurance company uses to tap into human memory, record it, and gather background information and testimony from witnesses about accidents. Mia who committed a murder to cover up another murder finds herself in a difficult spot as she also happened to witness an accident and an insurance investigator wants to interview her. It’s a consideration on the subjective nature and danger of memories as well as how we often cause ourselves more trouble by trying to cover up rather than address and resolve a problem. Seeing how the device works is fun and watching Mia try to stay ahead of everyone holds my attention. “Hang the DJ”—the title comes from lyrics in “Panic” by The Smiths—explores an environment in which a program arranges potential daters into couples for amounts of time ranging from twelve hours to five years as the program figures out an eventual perfect match. Many of the daters suffer from loneliness, restlessness, and disconnection. Watching the characters interact within selected relationships and respond to the various timeframes becomes interesting, but ultimately the episode doesn’t really go anywhere. It feels like “San Junipero” lite. Like “San Junipero,” “Hang the DJ” has an uncharacteristically happy ending, but this one feels a little ordinary. Without giving away the finish, the message seems to be that people still need to stay in front of technology and defy it from time to time, but like the takeaway of “Arkangel” it’s another easy and tidy meaning that we probably already know (but maybe need reminding of). “Metalhead” is set in a post-apocalyptic wasteland. A woman tries to get back to her camp and evade a killer robotic guard dog after a failed raid on a warehouse. This episode is very entertaining with shades of The Terminator, but again, what’s the point? Technology can be hostile? We got that one already, too. There’s a small surprise at the end when we find out the object of the warehouse raid, but it doesn’t really deepen the episode. The final episode of series four is the only one that approaches the best of the previous three series. The “Black Museum” is a roadside museum featuring technological artifacts that were involved in crimes. Some of the artifacts originate in previous series and episodes, so the self-referentiality of “Black Museum” is a bonus. Rolo Haynes, the proprietor, gives a tour to a lone visitor and recounts the fantastic history behind some of the artifacts. The individual stories and technologies are compelling as is the final exhibit of the museum, the reconstructed consciousness of a convicted murderer, which becomes its own plotline. However, it’s too little too late to raise series four to the level of the previous three. Perhaps my expectations are too high, but Black Mirror has more often than not succeeded in providing both entertainment and intellectual stimulation. Series four offers less on both fronts and is just okay with a few scattered high points. 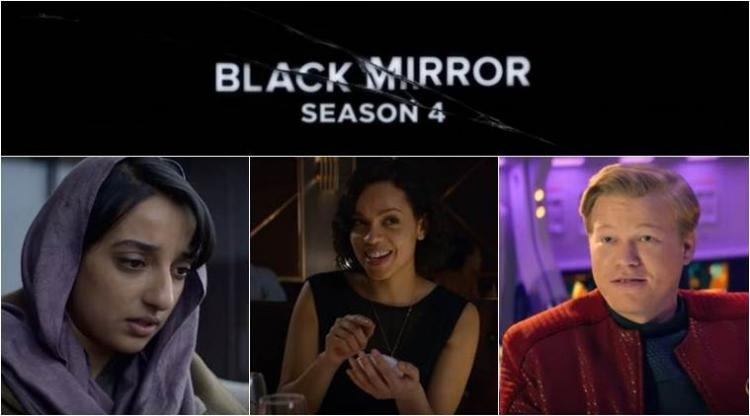 There’s nothing here that’s quite the equal of “Fifteen Millions Merits,” “The Entire History of You,” “Be Right Back,” “White Christmas,” “Nosedive,” or “San Junipero.” This latest series does make me wonder if Black Mirror is beginning to repeat itself and run out of ideas or at least rush them. Still, it’s worth watching. However, if you are new to Black Mirror, start with the earlier series.